Belonging to the United States Navy's Military Sealift Command, this large ro-ro ship can carry enough military supplies to support a Marine Air Ground Task Force for a month. 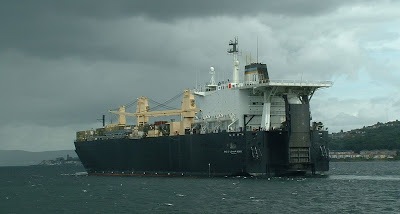 Described as a Maritime Prepositioning Ship, 2ND LT JOHN P BOBO has visited the Clyde on a number of occasions in the past, and was seen on one such visit in July 2004. She is one of five ships of the TAK-3008 AMSEA Class, and is based in European waters. She was built in 1985, and is 673 feet in length. She displaces 40,846 tons and can work with helicopters.